Ok, so even though I am on a strict self-imposed no-purchases-until-after-Christmas shopping ban, I couldn’t help but long for a few of the items in this Zara Evening Collection lookbook. Namely the red shift and the lovely rosette dress. Though with my luck (or lack thereof), both items will probably be sold out by the time I venture out to the store. But if you’re still looking for something fun to wear this Holiday season, perhaps Zara is worth checking out this month? What do you think? Have you heard about Pink Martini? Until a few weeks ago, I had no idea what that brand was. Strange, considering its popularity in the US. Luckily, I was invited to check out Pink Martini’s Fall 2010 and Spring 2011 collections at their showroom. What I found, were racks upon racks of fun, wearable designs with lovely detailing. 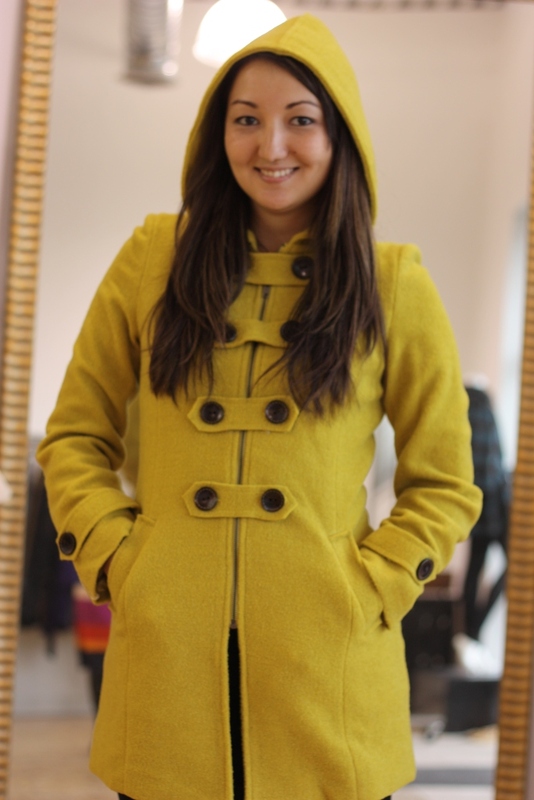 And though I can only share a tiny sneak peek of Spring 2011 collection with you (all the way at the end), you can check out some of the coats I got to play with. 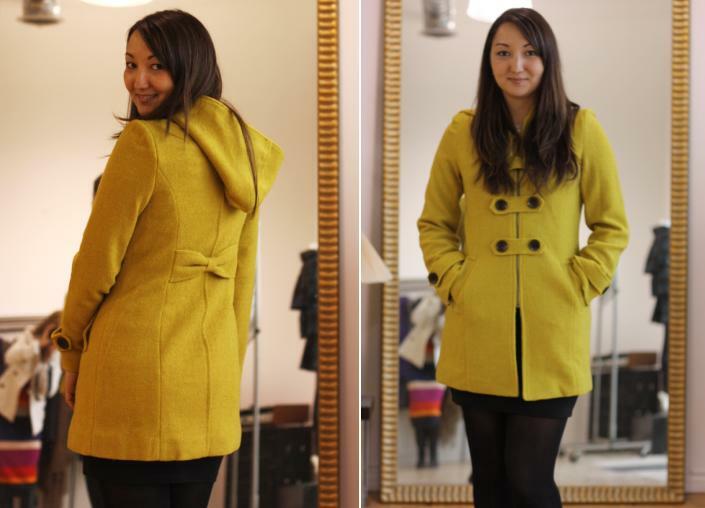 My favorite coat was definitely the yellow one in the first pic: super cozy, with an adorable bow detailing at the back, and a cute hood – this coat is sure to keep its owner happy and warm all through the fall. I also adored the chunky knits, including some colorful circle scarves, and wraparound sweaters that I did not want to take off. Keep an eye on Pink Martini, lovelies, come spring, you’ll fall in love with their beautiful cocktail dresses, funky rompers, and intricate tops…oh, my! It seems just yesterday, I found out that I, along with nine other lucky ducks, won Yorkdale’s Yorkdale is Me contest! It was an awesome and memorable journey, and it was an honor to be able to participate in the mall’s Spring 2010 campaign. 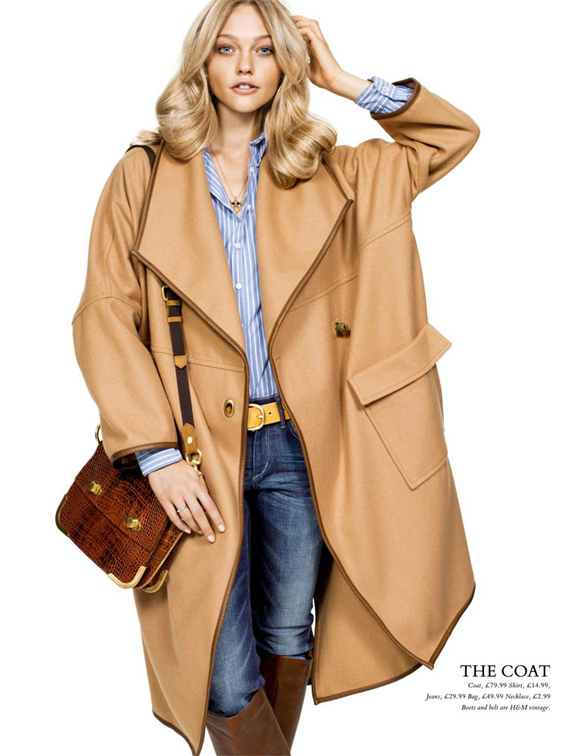 Well, it is spring no longer, and Yorkdale’s Fall 2010 campaign is now out – and I love it so hard! The thing that definitely drew me to these is their aesthetic. Totally inspired by Tommy Ton photos, no? Love that the campaign focuses on the many different styles and price points the Yorkdale stores carry. And since I’m an H&M junkie, I love that items from my fave store are featured a few times (can you spot them?). Overall, I find that these photos are very different from other malls’ advertisements, as well as compelling enough to make me want to go hunting shopping for those sweet camel-colored boots…now! What do you think? Are you loving this campaign as much as I do? Let me know in the comments. Last week, The Bay unveiled Fall 2010 Menswear Designer collections at its West End Shop with a little help from Steve Yzerman and Alex Bilodeau. With brands like Hugo Boss, Armani Jeans, Diesel, Ben Sherman and many others, all neatly located on the second floor, The Bay on Queen St. has become a premier shopping destination for high-end brands. And who better to be the face of the shop, than the hockey legend Steve Yzerman himself? When le boyfriend first heard that “Yzerman” was going to attend, there was no doubt he wasn’t going to miss out on this opportunity. And by the look of the lineup to shake hands with the former Red Wings captain, he wasn’t the only one. After Brian Williams interviewed both Steve and Alex in front of the stylish attendees, both men helped pick out Hugo Boss and Strellson raffle winners (someone next to me was excitedly hoping to get the Hugo Boss suit Steve was wearing). 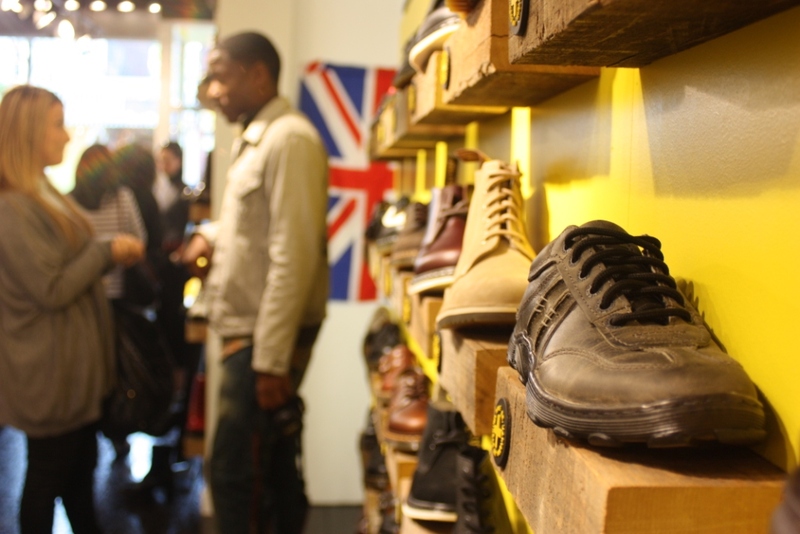 West End Shop itself is a large bright open space, full of well-displayed mix of brands – definitely a lovely spot to do some shopping for your guy, be it for casual clothes or high-end suits. I love the recent overhaul The Bay has undergone, stores are getting renovated, layouts are easier to navigate, and with ever-expanding brand selections, the store is a pleasure to shop at. If you haven’t been recently, you really should see the difference for yourselves. Fall is upon us, and just like many others, I am embarking on a new footwear search. 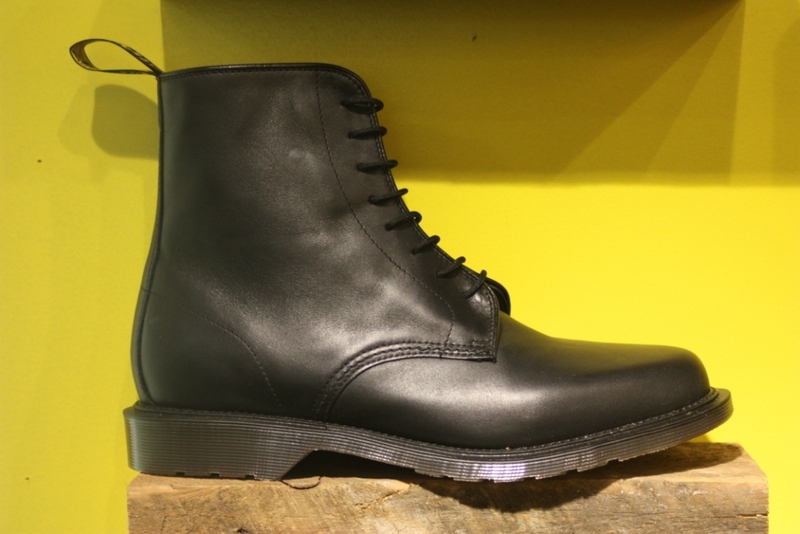 This year I vowed to buy something practical for Toronto winters, something sensible, with a stylish kick. 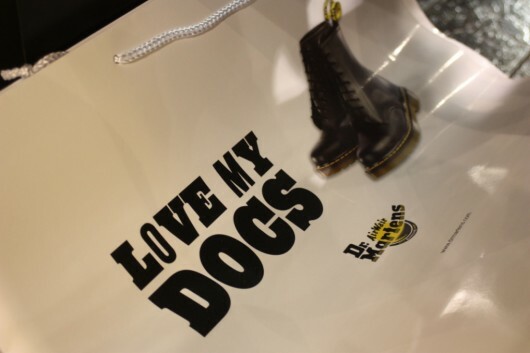 And after visiting Canada’s first standalone Dr. Martens store at 391 Queen St. West, I think my search is over. 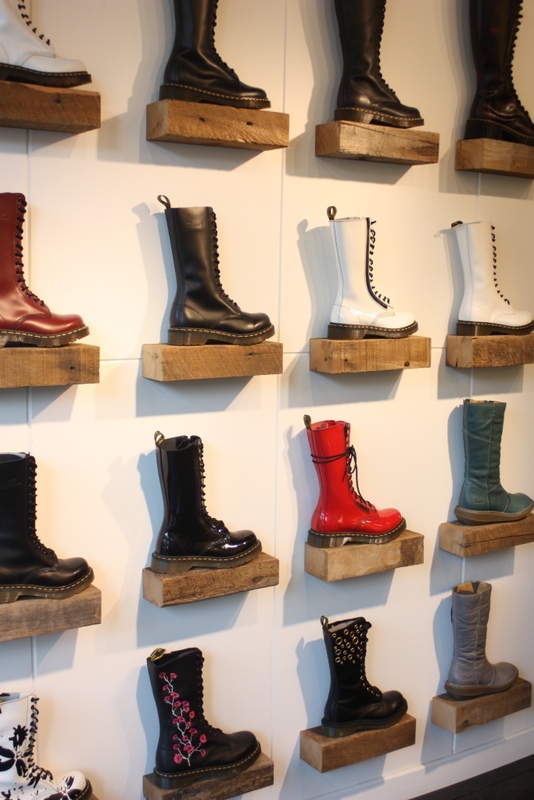 The shop’s walls are lined top to bottom with different styles and colors of the iconic grunge-fave shoe, and the whole feel is like being in a candy shop – just take your pick. 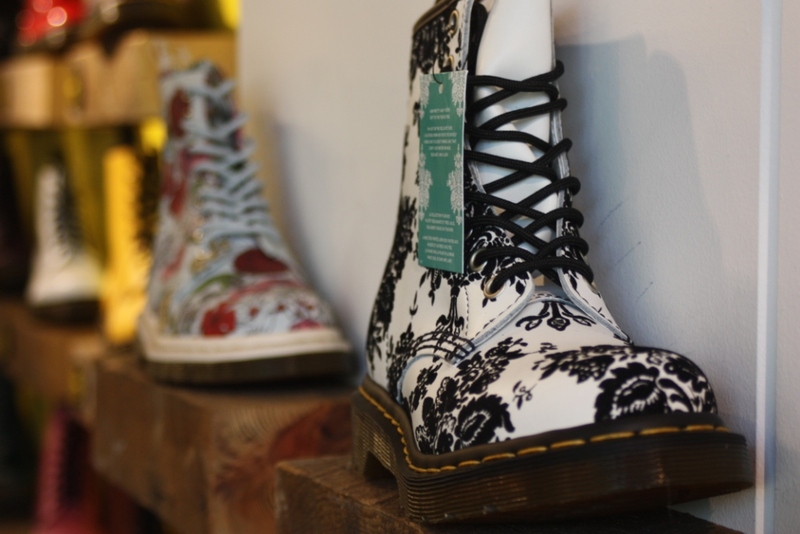 There are girly shoes – with floral and paisley designs (my fave), the “originals”, the “Made in Britain” pairs, and some not-so-Doc looking Doc Martens. I was also told that most styles available worldwide will be sold at the Toronto store…all neatly lined up under one roof. 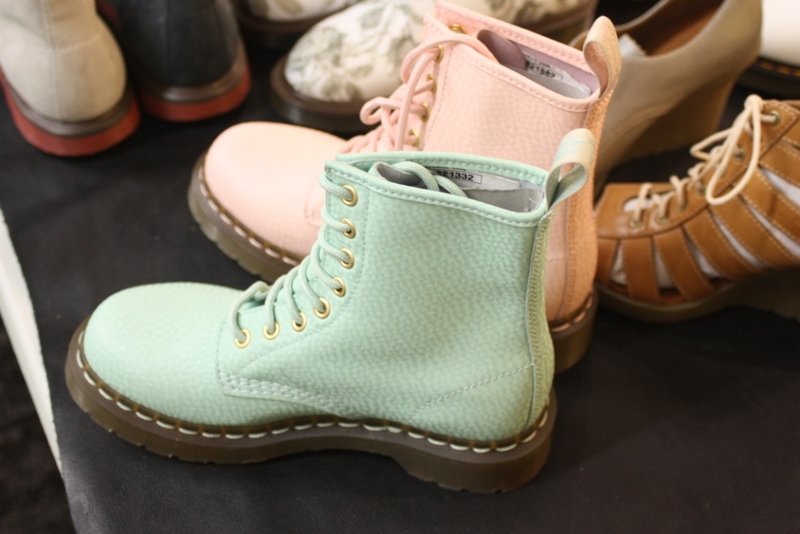 I also got to see the Spring 2011 lineup of Docs, which included the below pony hair leopard print styles, which I believe were made in collaboration with Opening Ceremony, some cute pastel ones…even gladiator wedge Docs! 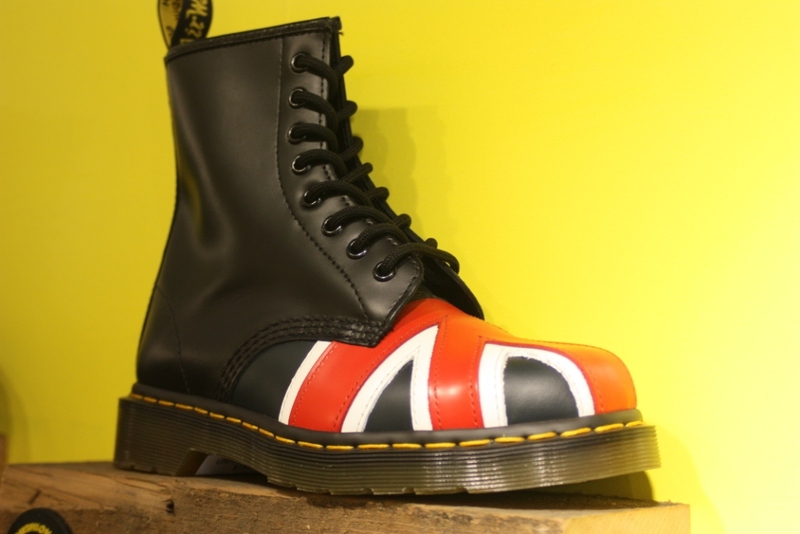 It’s pretty safe to say, that if you’re looking for a specific pair of Dr. Martens shoes, the Queen St. store will have them. 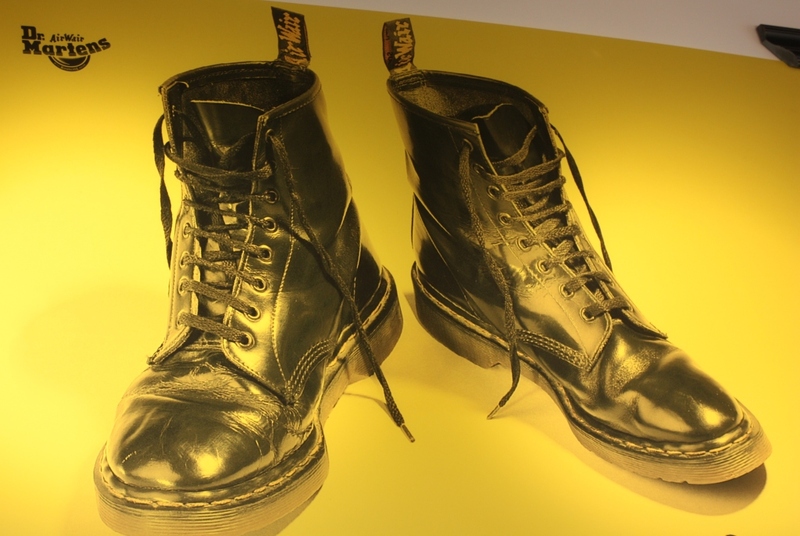 Most shoes retail between $100-$200, which is not a high price to pay for a comfy, well-made, classic boot. The company is celebrating its 50th anniversary this year, so make sure to pop by and say “Happy Birthday!”. Here in Canada, we’ve been royally spoiled this summer – endless summer days, warm patio nights, trips to the lake, and finally some sort of resemblance of a tan! I don’t think we’ve ever had a summer this amazing! But as they say, eventually all good things come to an end. And here we are, going into another fall season, pretty hopeless after completely blocking out what it feels like to walk through slush and hurricane-like freezing winds (or is it just me?). So in order to get excited about the inevitable chill, I thought I’d share some of my Fall 2010 Essentials with all of you (if you want to see my Fall 2009 essentials, click here). Read about them after the jump! Billabong – the name is almost synonymous with surfer clothing, no? Apparently – wrong. After attending Fall 2010 preview at the Yorkdale store last week, I realized that Billabong not only caters to surfer dudes, it has a fashionable side as well! 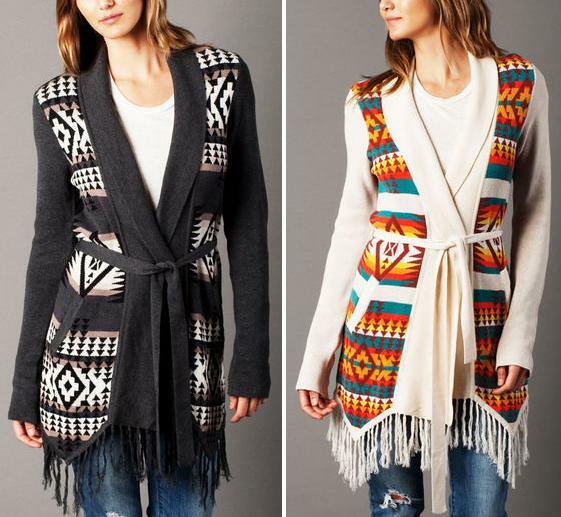 The first thing that caught my eye as I entered the store was a multi-color Portola cardiganwith fringe detailing – a super amazing boho piece, perfect for wrapping oneself during the cold winter nights. I knew I had to have it. Throughout the store, I spotted a few other cozy-looking cardigans, faux leather jackets, super cute black dresses, and a ton of on-trend accessories. Wait, at Billabong? Yup, at Billabong. 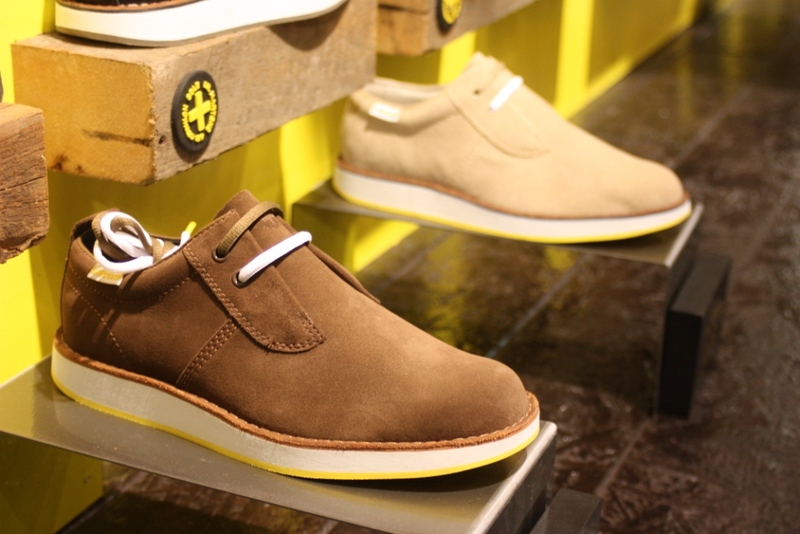 Other than Billabong, The Yorkdale location carries brands such as Element, TOMS, Nixon, Von Zipper and Dakine. And of course, there are rows of bikinis. Bikinis and shorts that are available all year-round. So if you’re looking for one in the middle of January, Billabong is definitely a safe bet. For guys and boys, the collection seemed to be a bit more grown up from what I remember. 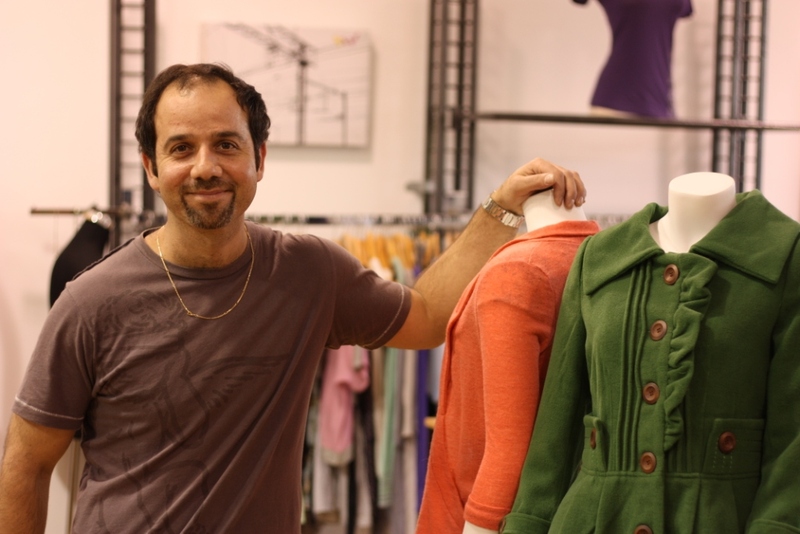 There are still plenty of hoodies and t-shirts to go around, but there are also classy button-ups and sweaters available for the dressier occasions. Another cool thing that Billabong store carries is Saxx underwear. It’s pretty great to see a small company with a great idea represented at a bigger store. Plus, guys seem to looove Saxx. If you don’t believe me, get it for your man, and see him rave about the…ahem…extra support. Overall, I was pretty impressed with the Fall 2010 collection, and having worn my new cardigan around the house, I can’t wait to take it out for a spin in the real world! I’m definitely packing it for my upcoming trip and will share some pics after I come back. 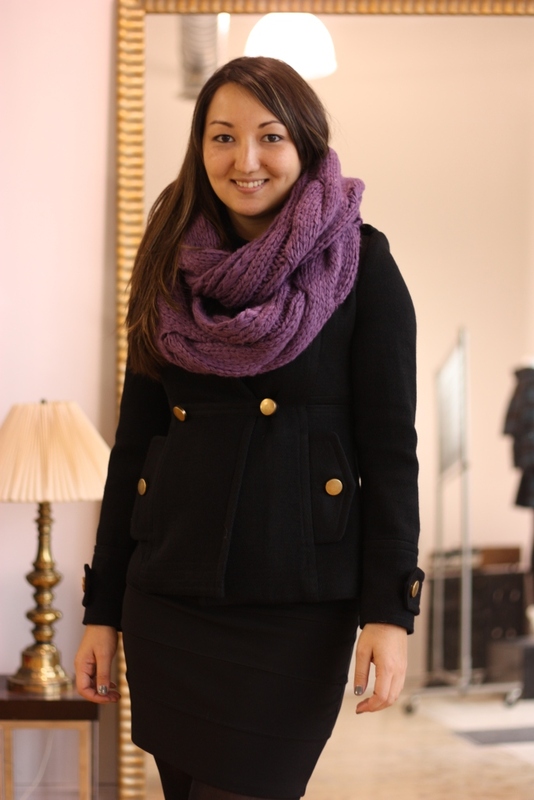 You may see more Fall 2010 pieces on Style Blog’s Facebook Page HERE. Now what about you, lovelies? Do you shop at Billabong? Let me know in the comments. Huge thanks to Micki Benedetti for the invitation!